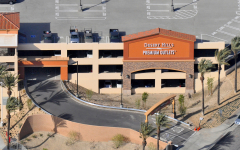 The new 1,800-space, four-level parking garage alleviates parking availability problems at the Desert Hills Premium Outlets in Cabazon, California. 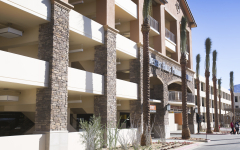 The aesthetics of the parking garage closely resembles the architecture of the new and existing outlet buildings. The garage is also more centrally located to minimize the travel distance of pedestrians, and includes various entrance locations for ease of access. 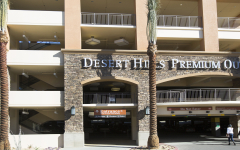 A complete parking guidance system is utilized on all levels of the parking structure. This system optimizes the search for open parking spaces, reduces traffic within the garage and relieves pressure on adjacent streets. One challenge the team faced was the installation of the escalators. 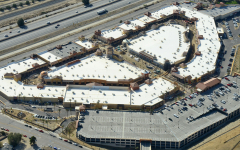 Due to the unpredictable desert climate, a more robust weather protection system was necessary and a special flashing and cladding system was developed during construction. Unique drainage swales were created within the post-tensioned deck to allow water to drain away from and around the escalator at all levels.